There are a lot of places to find free homeschooling worksheets on the web. Here is a list of the best sites that I have found. Most of the websites that I have listed I have used when teaching my own children. Most of my recommendations are for elementary aged children. Some of the activities are appropriate for preschoolers. You will find worksheets for Bible, math, grammar, and handwriting. There are even some fun things to do like dot-t--dots and coloring pages. 1. Garden of Praise has more than free homeschooling worksheets. There are biographies that are written at the elementary reading level. The biographies are of United States presidents, women in history, inventors, authors, artists, explores and other famous people in history. For each person there are worksheets that you can print and online activities. Garden of Praise also has an art appreciation section. There are lots of different famous pictures to look at. There are printable and online activities for each artist. There are also comprehension worksheets for 20 different children's chapter books. What really makes Garden of Praise unique is it has a section of Bible lessons. The story can be read to you online. There are also word scrambles, coloring pages, crossword puzzles, songs, and other activities that go with the stories. 2. Education.com has worksheets for preschool through high school. There are math, reading, writing, science, and social study sheets. The site is well organized. You can search by grade and subject. I like some of the added features the site has. There are paper dolls from around the world and different periods of history. Another feature is printable board games. Some of the board games are for bingo. Other games you move your marker around the board. I especially liked the math board games. I did see some worksheets that I would not want my child to do. As with any site you need to preview to make sure that the materials fit your family’s values. Education.com also has games. I played the sample version of the tangram game. I thought that it would be fun for a young person. To play the full version of the games you need to pay a fee. 3. Math Worksheets Land is a new site for me. There are free math worksheets for preschool through high school. You can find worksheets by grade level or by subject. Some of the lessons have guided lessons to help your child understand how to work the problems. I also found math tests for kindergarten through seventh grade. I know that I will be visiting often because there are pages for older children. 4. Coloring Castle has a lot of different coloring pages to download. There are sheets for holidays, numbers, shapes, and animals. There are also some connect the dot pages. The pages that I really like are the United States maps and the different flag pages. 5. Learning Page is a site that I used when I had younger children. I also used the site when I worked for a school district. The one thing that I don't like about the site is that it requires you to set up a membership. The membership is free though. Learning Page has worksheets for preschool through third grade. You can find worksheets for handwriting, math, and science, different themes such as the ocean, dinosaurs, and insects. There are also downloadable EWE books, mini books on different subjects, and vocabulary books. The Tommy Tales also come in a Spanish version. When my children were young I used the telling time and money worksheets. At Free Phonic Worksheets there are 81 phonics worksheets. The worksheets go with Rock n Learn but you can use them independently from the program. The site also has word flashcards that you can download. Besides phonics you can download fun math worksheets. There are mazes, search and find, connect the dots, and color by number. 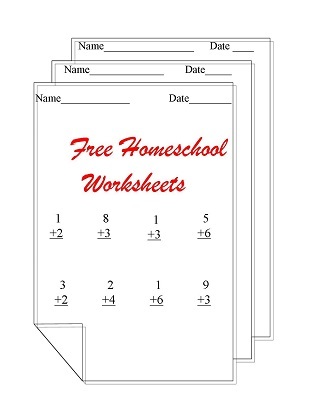 Free homeschool worksheets can save you money especially in the early elementary grades. Many sites list their materials according to grade level. If your child is in the first grade you can download math and language arts papers. To save even more money just download what your child will use. You could even bookmark a site then each day print activities for that day. One way to save money is to download PDF files to your computer. Then have your child type the answer on the page. Save a copy of the new page onto the computer so that you can correct the answers. I am able to do this with most files written in the newer Adobe. You can use free homeschool worksheets to supplement your curriculum. If your child is having trouble in an area you can find a worksheet for more practice. Another way to use free homeschooling worksheets is to find worksheets to go around a theme so that you can make a unit study. Many sites have themed activities that you can download. Free homeschooling worksheets can save you money and are easy to use. So go to the sites listed and download some today. Return from Free Homeschooling Worksheets to Homeschooling costs.